Three years after On the Waterfront, this formula movie discovered the waterfront racket all over again - as though the exposé was brand new. 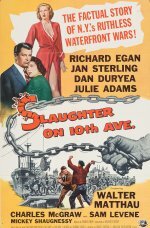 Craftily directed by Arnold Laven, it has assistant DA Richard Egan at war with the crime and grime around the docks, and finding true love with a longshoreman's widow, Jan Sterling. Dan Duryea is the heavy, but there's no Marlon Brando this time around.